We’re officially one week away from the premiere of The Force Awakens! If you’re as excited as I am, then you know how long the next seven days are going to feel. Thankfully, we have the e-learning challenges to keep us occupied! Help Leia and Chewbacca respond correctly to Vader’s questions and secure the alliance in this quiz from Trina Rimmer. Even the Empire needs annual ethics training. Test your ethics skills in this creative scenario from David Lindenberg. 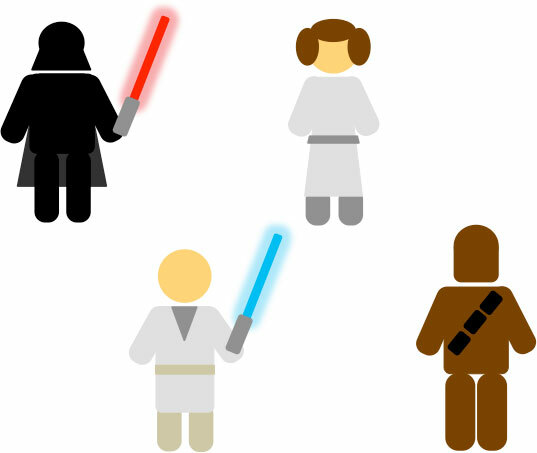 Download a free set of editable Star Wars characters created in PowerPoint. 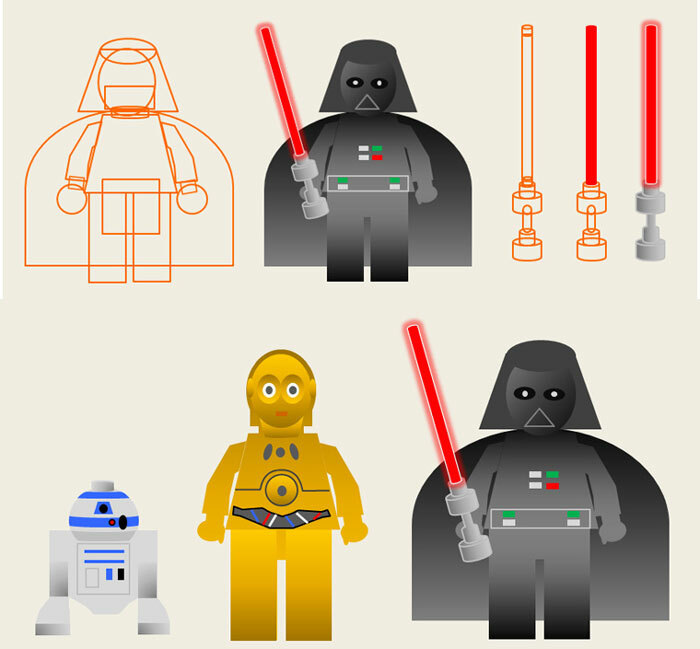 Learn how to build your own vector characters in PowerPoint. Cool use of pop-up captions for videos by Matt Guyan. 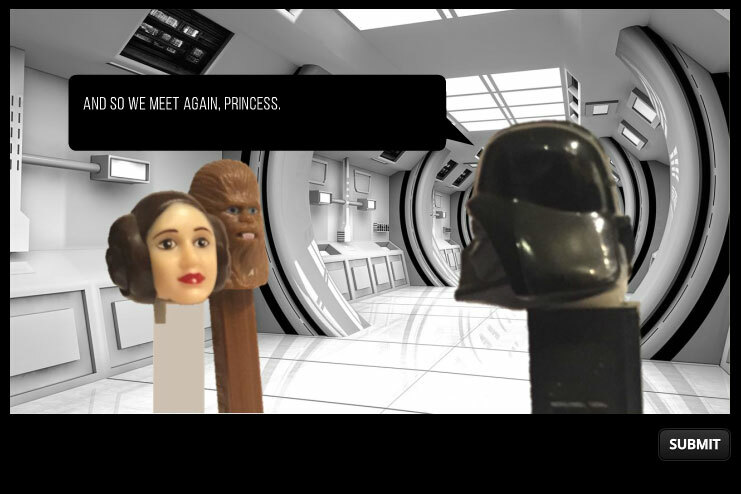 Build a Star Wars-themed interaction, this week your challenge is. Okay, that’s the best Yoda impression I can do. 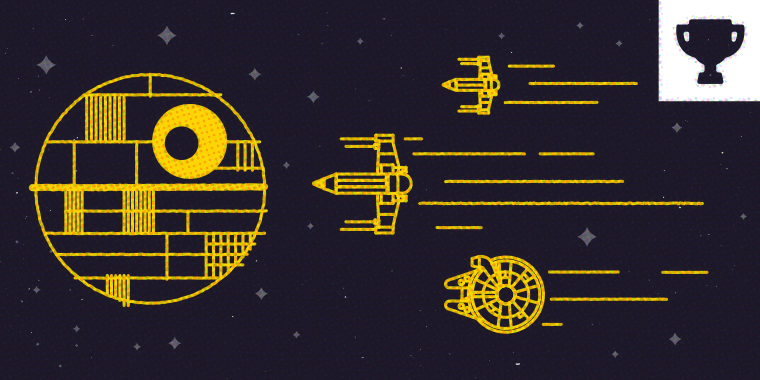 Wishing you a Force-tastic week, E-Learning Heroes! Those aren't the examples you want to share this week. You're free to move about the challenge. Hi David - I'm new to submitting a challenge, but I've got something I'd like to try and share but I don't know how! How do I submit it? Awesome! You can do a few things. First, you need a place to post your published files. 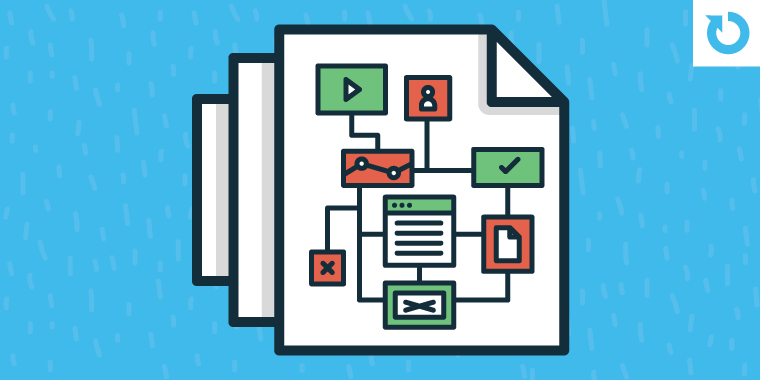 This can be Dropbox, Google Drive (although they're discontinuing hosting soon), personal website or blog, or you can send me your files and I can post them on our servers. I'm more than happy to post your files on our servers. Let me know what you'd like to do. Thanks, Sarah! Brilliant! Thanks and have a great weekend, Sarah! David, Im having some trouble getting dropbox or google to host my project. Could i get it to you for hosting please? I'm so loving this design Nancy. David tweeted it and it really popped out! Thanks Jeff, it is amazing what you can do by cobbling together a bunch of different stock images. Thanks Kevin - your avatar is blowing my mind. Love it! Very festive! I love the design, Nancy! I really liked that Mary, well done! LOL that was fun, Mary! My kid kept trying personalized phrases looking for nuances in Wookie. Excellent. I had no idea how my name sounded in Chewy speak. I can't stop playing with this one. So much fun. Back to work, but I must get. Much more fun than Google translator, Mary! Welcome to the challenges Adam. Nice work on the animations! I liked how you created the intro. Have you thought about putting the 'next' arrow pointing downward as that is where the text is flying in from? "Luke, I am you Biggest Fan." Hey Adam this is wonderful. I crashed on the first question and noticed that you showed me the question again. It might make sense to eliminate the second try in a game like this especially since each question only has 2 options. Maybe you could display a score instead. Loved it Adam, looks great and great music! Thanks for the explanation. I love how you go above and beyond with these things. Hi Melissa, the counter does not seem to work for me. I tried it in Chrome and IE on my desktop - and also on my iPad and in all cases the counter just sits at zero. When I said zero, I meant 00001. Mel just tweeted and said it goes to 00001 and then stops: So all is good! That's the one and only Jeanette! My entry is a Drag & Drop interaction - SITH or NOT A SITH? http://goo.gl/wVAAUb I incorporated David Lindenberg's Darth Vader Pictogram to give feedback! Thanks, Michael! I just found out about Chad when I did a little research for the challenge. The YouTube clip I watched was hilarious! Great concept Tracy, very engaging. Hah, I like the response for choosing jar jar to be sith. Nice interaction Tracy, but the Chad Vader thing went over my head. Funny Sarah! It made me stop, think, retry, and retry again. It got my attention. Nice touch on the light-color mouse over. Hi everyone! This is my first e-learning challenge - a great one to get my feet wet! Here's what I came up with: http://googledrive.com/host/0Bz70wh9c1kKJVkVrdjB2YjNCdGc Special thanks to David Lindenberg for the pictograms. They truly helped! Welcome to the challenges, Peter! Do you mind checking your Google Drive permissions? I'm being asked to log in to view your example. I'm sure it's just a permissions setting. Thanks, Peter! I just switched the folder to public. Please let me know if it's still requiring a login. Thanks David! That is cool. I love how you created the characters and the lightsaber slider; great idea. Nice to see your treatment and expansion of the pictograms. Great first entry Peter! Welcome to the challenges! Awesome! Loved the lightsaber training! Peter great animations at the beginning and I really liked the idea of the lightsaber slider. Welcome to the challenges. Very cool intro Aman, great animations. Beautiful and mesmerizing design Aman. Wow! I feel dizzy... Nice work, Aman! Nice use of the TIE Defender! That is very cool Jordan. Well done. Great work! Would like to see more on how you put this together. Thanks EJ! I will try and write an article on how I made the game and upload it to Heroes this weekend as well as sharing the source file. Excellent stuff Jordan, this has great potential for making it a full game! I'm a fan. I scored 1. I would not survive space. :) Very nice, Jordan! It was really good animation with laser sward. Very clever Tracy! Well done. Cool! Where can I buy my lightsaber?! lol Tracy, great minds think alike :) Great job. Very clean and wonderful experience. Lightsabers are big this season! A Jedi in training, I am not. Fun! That is a challenge! Awesome combination of triggers and sliders. Sith, I am. Loved the scenarios, Brian! Someone steals my Jedi Master Parking Spot and there's no way I can be at peace! Nice one Brian. Great write-up and use of free resources. Creative! Good stuff! Love the character images and the humor. How do you get projects to go full screen like that? And is all this animation done entirely in storyline??? Cool Concept for creating Star Wars Quiz. Well done! Thanks Aman for appreciation and it means a lot for me. 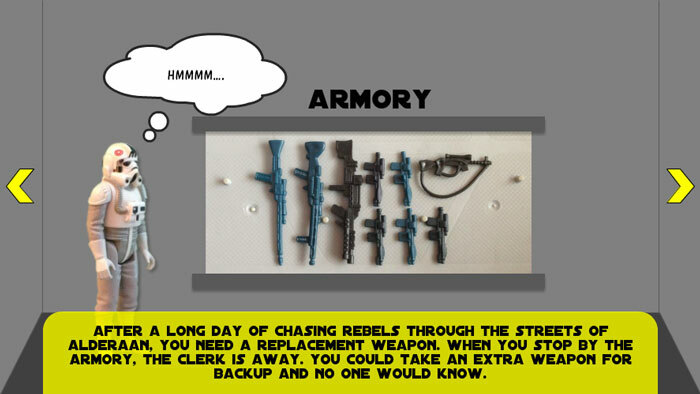 I kept concept of single select in theme of star wars. When we get the appreciation then only we get to know how good the work is and it also acts as a motivating factor. Thanks for appreciation Joanna. What a fun (and funny) idea. Nice work! Thanks Jay for appreciation! I tried to fun with laser sword of star war. Great idea Avinash. My only suggestion would be to make the next question arrow a different colour. It took me a minute to figure out how to navigate to the next slide. Thank You Linda for feedback ... I have updated it. Nice idea Mike, too bad it ended so soon, I would have liked to try again.